By now, back home, our first few days in Georgia are a blur. If it weren't for the neat, a-page-a-day itinerary provided by the local agency, GDM, plus my old-fashioned pocket-sized diary, plus the photos on my iPhone, plus my handwritten travel journal, I'd be at a total loss as to which church was where and which courageous prince or warrior was when. - Our room was on the 13th floor. Quite commendable, in my opinion. I disapprove of hotels that "don't have" a 13th floor, catering to superstitious clients. The dining room was on the 2nd floor. So down we went at 8 o'clock in the morning, looked right and left, and saw no sign implying FOOD SERVED HERE, or anything to that effect. But there was a large double door. Whose large built-in handle we tried to pull with all our might, to no avail. Confused, we went to the front desk and said the restaurant was still closed. Ucha (nice kid!) smiled at us and said he'd come down with us and show us. Guess what? He pushed the door and it opened wide, to reveal a fully functioning dining hall... I bet Ucha and his friends had a good laugh at our expense. - Shortly after breakfast, we got a call from the front desk saying our guide was waiting for us. We went downstairs, and when we saw a purposeful, guide-like young woman looking around, we assumed she was there for us, and dutifully began following her towards the exit from the hotel. Luckily, the Front Desk noticed, and with alacrity prevented us from being whisked off by the wrong guide. I've always been fascinated by bridges and bridge-building. For years, pics of Brooklyn Bridge and Manhattan Bridge took turns as "wallpaper" on my PC; and The Mystery of Bridge Building by Robert Benchley has been a longtime favorite of mine. So, despite the crowd of tourists and guides, I enjoyed walking the length of this bridge and taking pictures from various angles. We were dropped off at our hotel around 2p.m., and after our nap, walked along Pekini Avenue, turned left or right or whatever, and eventually came across a small restaurant -- Kasumlo Caucasian Cuisine -- that looked like a small family business catering mainly to locals, but was still centrally-located enough to attract the occasional wandering foreigner, as I deduced from the fact that the menu was also in English. The waitress didn't speak English, but we took our chances and got along fine. Except for the business with the soft drink for me. Apparently, in Georgia, "lemonade" covers a multitude of soda-pop flavors, the most common of which seem to be tarragon, pear, lemon, and [vanilla] cream-soda. But obviously, I didn't know that at the time. I asked hopefully: "Diet Coke? Diet Sprite? ", but received only a puzzled shrug. "Zero?" I tried, drawing a round "zero" sign with my hand, and suddenly something clicked: "Ah, Pepsi!" said the girl brightly, and brought me a bottle of Pepsi. I scrutinized it suspiciously, not seeing anything that said "diet" or "lite". 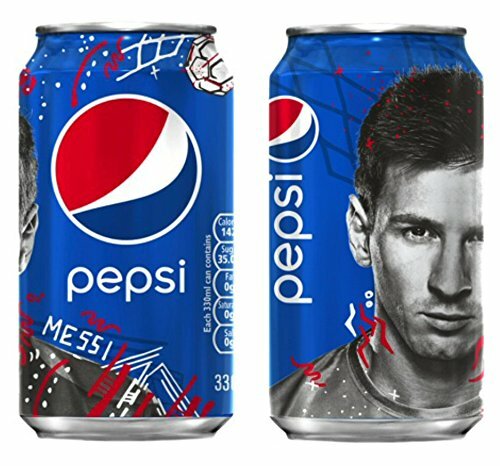 Bravely, I walked over to the drinks refrigerator and inspected the bottles on display, comparing the bottle in my hand to the other Pepsi bottle, with a blue label and a picture of Messi. 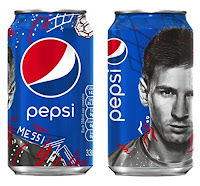 "I don't think Messi would be advertising a diet drink," I said. "Dieta!" said the waitress, finally finding the right word, and showing me the tiny print on the back of the bottle she had given me, where it actually indicated zero calories. Phew, sigh of relief! Now I could enjoy not just my dinner, but a huge portion of chocolate-vanilla ice cream for dessert! Mt. Kazbek Yes, Ushguli No.